When it comes to marketing through social media channels, you can’t argue with the fact that Facebook has over a billion users now. There are half a billion people that you have the potential of reaching through Facebook that you couldn’t possibly reach through another network. When you consider that the average user logs in more often and spends more time during each visit, a Facebook presence becomes a no brainer for anyone wanting to build an online presence. With so many advantages, you’re probably wondering how other platforms such as Twitter and Pinterest drive as much or more traffic to your website. The answer to that question is complicated; the biggest reason likely has to do with the psychology of users on different networks. Facebook users are there to catch up with friends, and prefer staying on the platform. Other networks are used for content discovery, which means that some users actually want to click your links. The second biggest reason likely has to do with Facebook’s EdgeRank algorithm. EdgeRank is the method that Facebook uses to sort the posts in your feed so the content they perceive as most important to you shows up first. When you sort your feed by ‘Top Posts’ instead of ‘Most Recent’, EdgeRank decides which posts you see. Since 95 percent of users sort by Top Post, EdgeRank has become a fact of life for most marketers. Facebook has put a lot of work into their algorithm, and they have acknowledged that it’s too complex to be easily explained. Most of the factors that contribute to EdgeRank however are used universally for bookmarking websites, what’s hot scripts, and other applications that intend to show the most popular stories that are still considered timely. Facebook presented this change as a simplification of discovering content that you actually wanted to see, and inspiring engagement by figuring out which stories you were most likely to connect with. Most users interpreted this as control. In this formula, P= points, minus 1 for the vote of the person who submitted. T= time, and G= gravity, which is defaulted to 1.8 in the open source Hacker News files. This algorithm makes each submission’s score decay over time, to a point where brand new submissions that get just a few votes can overtake old submissions that have a couple dozen. Here is an example of how posts perform over time on Hacker News. Facebook revealed the factors that are at work in Facebook’s EdgeRank algorithm during the 2010 F8 conference. They are Affinity, Edge Weight, and Time Decay. Those factors roughly translate to Points, Gravity and Time Decay as listed in the Hacker News algorithm. There are some important differences however. For use in this lesson, an Edge is described as any action a user takes (a status update, uploading a picture, changing their profile picture), which can be displayed as a unique story in the feeds of their friends. Edges can also be a like, comment, share, tagging, or even an initial friend request. Affinity – Affinity is the measure of how connected a particular person is to the edge. The people that interact with you more have a higher affinity for your content, and therefor are more likely to see your posts in their feed. Each action is weighted based on the amount of effort it takes to complete that action. The measurement of affinity not only takes into account the history of engagement, but number of mutual friends, how recent those engagements were, and now it even has data regarding which group a particular friend is filed under, and if you have ever hidden them from your feed. In addition to all these metrics, affinity also looks at the relationships you have with others and how it’s all interconnected. For example, if you have three friends that are also fans of Social Media Sun, you’re more likely to see our updates if they have engaged with our brand recently. I have collected a ton of data regarding Facebook shares, impressions and click-thrus, and I suspect that all of the metrics are pro-rated to how common they are at a given time. When 80 percent of the actions on Facebook are likes, likes have less power than when stories are driving comments more. This is likely applied to all metrics, making EdgeRank a living calculation that is based on the makeup and activity of the network at any given time. Edge Weight– Specifically, edge weight has to do with how one edge is weighted against another. Comments are always going to have a higher weight than likes, and tagging has certainly diminished since it has become more popular as of late. This value plays a direct role in EdgeRank because each edge also has the potential to be displayed as a story in your feed. The same goes for pictures and status updates. Since pictures and video inspire much more engagement, you’re more likely to see an uploaded photo than a lone status update. You will often see “Your Friend Commented on This Post” or “Your Friend Likes This”. You’re more likely to see a story about your friend commenting on a post than liking a page because the basic edge weight of a comment is higher. This goes back to the basic principle that you want to see the most important news, and that something that is more common probably has less importance. Time Decay– The last factor is time decay. The older a post is, the less likely it will be displayed in your feed. With an extremely large amount of interaction, a post could stay at the top of your feed for a couple days, but there is a point where even the most popular post in the history of the network would drop off the feed. The easiest way to understand this is by examining the Hacker News algorithm. The gravity value can be changed to account for activity on the network, but after 20 hours even the most popular posts usually fall off the front page. 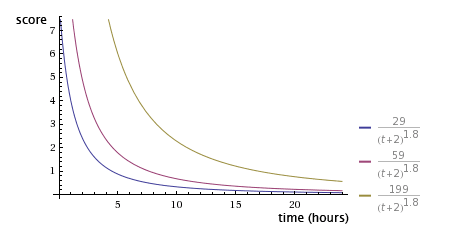 This diagram shows the effect that points, time decay, and gravity have on the score of individual posts on Hacker News. It also shows that the equation is non-linear, and posts will fall off the front page after a given number of hours no matter how many votes they get. EdgeRank is most powerful when you’ve been logged out of Facebook for a few hours. If you’ve consumed the bulk of the featured content and stay online for a while, you’ll start to receive almost all the posts as they’re submitted. The algorithm chooses posts differently for someone that hasn’t logged in for a week than it does for someone that logs in daily. It may also consider how often you usually login. A user that logs in daily would likely want daily updates, even after missing a few days. A user that logs in weekly is expected to miss a few days, so a story that is a week old may be fair game for them. This is a trait that complicates EdgeRank, almost as much as the confusing Affinity metric (which is more complex than most popularity algorithms itself). EdgeRank is as much about delivering pertinent and interesting content to users that have been logged off as it is about sorting the best content to the top. Some businesses believe that EdgeRank is a ploy by Facebook to limit each Page’s access to their fans so they will invest more money in Facebook’s new advertising products. Whether by design or by coincidence, brands on Facebook now have to try harder to spark engagement with their fans. I have heard several opinions regarding the changes Facebook has made to their algorithm recently, and they’re as varied as the results people are getting. Facebook marketing coach John Loomer thinks that Facebook provides phenomenal reach, and blames inflated expectations for the dissent among PPC professionals. An average post reaches 16 percent of your fans, but John has set a benchmark that promoted posts will allow you to generally reach 35 percent (we’ll hold this as our promoted reach). In a recent guest post, John referred to Facebook fans as a moving target. Users aren’t using the platform 24/7, and aren’t guaranteed to login every day. A recent promoted post on the SMS Facebook page generated 10 click throughs when targeting ‘friends of friends’, which isn’t that great. However, our primary goal was to create awareness of our brand, and turn some users into long term readers. 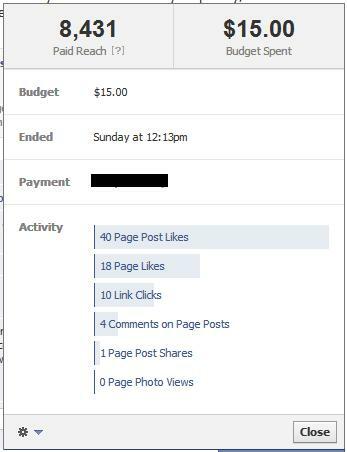 18 more users liked our page, and 40 liked the post itself. How do you estimate a value on an ad product that provides a mixture of results? To add some perspective, e-mail marketing open rates hover around 20 percent, and this is what John calls a “stationary target”. He thinks that users are asking too much to expect more than double what a tactic such as e-mail marketing offers. I don’t think John is considering the average Facebook user. Users that have less than 200 friends and log in several times each day should have no problem viewing all the updates posted to their stream (I could do so myself), but since Facebook instituted EdgeRank, this has not been the case. Also, Facebook actively marketed advertising as a way to attract fans in the past, which marketers saw as a short term investment to develop a long term marketing channel. Overall, the reach of an average page has decreased since EdgeRank. Since some brands have already paid for the fans on their page, they feel like they’re being charged twice to complete a single objective: reach their fans. Not every update has to be topical or related to your business. Your fan base no doubt has incidental interests that are shared with others. Try posting updates about recent news events, your thoughts on popular television programs, or important information about Facebook. You can also increase affinity by reaching out to users on an individual basis. Seek them out on Facebook, or better yet, other social networks that can’t be measured by EdgeRank. By increasing the affinity of another industry influencer, you can increase the affinity of your common fans. Do not worry so much about how many likes your page has. Even though individual affinity plays a big part in your EdgeRank, the overall affinity of your fan base will also affect your success on the network. Buying likes will only hurt the relationship you have between total fans and engagement numbers. It’s also a bad idea to get users to like your page if they aren’t genuinely interested in interacting with your brand. Another subtle threat comes from a group of users referred to as ‘booklicants’ that have a tendency to like too many pages and make too many friends. With the increased competition, it’s unlikely that your updates will ever hit their feed. Your ideal like comes from an actual fan that doesn’t like hundreds of other pages, and has some friends that also like your page. I see almost all the updates from a few pages that 40 percent of my friends also like. Lastly, try posting media that has a higher edge weight such as photos and videos. I have also noticed that birth announcements are given preference in the feed, which suggests that Facebook can decipher contextual information from your posts. News that is actually important may not need several engagements to be labeled as such. The EdgeRank algorithm is so complex that third parties will never be able to accurately predict a post’s value in the feed. Programs like EdgeRank Checker can give you a rough estimate of how much engagement your posts are getting however, and by analyzing your own Facebook insights you can optimize your content to better inspire engagement. Even though Facebook has never publicly confirmed the existence of a second algorithm, several consultants have speculated that EdgeRank is actually just the first calculation. The second algorithm is believed to introduce chaos and facets of traditional display back into the feed so you get a variety of content, certain users don’t overtake your feed, and Facebook’s predictive powers don’t seem creepy. With a wildcard generator standing between EdgeRank and your feed, you can never truly guarantee that a post will be seen. EdgeRank is the gatekeeper of the most popular social network on earth. It’s imperative that you understand how it works, how you can optimize your content, and the various actions that can have an effect on how well your posts do. Algorithms are only going to become more complicated and involved as time goes on, so get used to it. If you want to market through Facebook, you’re going to be subjected to their platform. 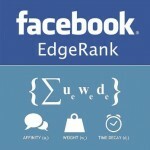 How has EdgeRank affected your Facebook marketing efforts, and how have you adapted your strategy to compensate? Thanks for this information! We have just been talking about all this today so it’s great to get fresh information and views on the topic. I am keen to get my head round Edgerank and this post goes someway in helping to demystify it. I guess we are still in the early stages when it comes to totally understanding how Social Media sites work and how they plan to generate income etc. but I’d say any move towards genuine content and folks that genuinely engage and use these platforms socially must be positive. Good post. Thanks for stopping by Laurence. Actually, we have a pretty good understanding, but the exact algorithms are very well protected, and the programming is far more complicated for something like EdgeRank or Google Search than the Hacker News algorithm. Tim, I clearly state that 95% of Facebook users sort their feed by Top Post. Look at the last sentence in the 3rd Paragraph (actually, the sentence RIGHT AFTER the one you’re referring to) – “Since 95 percent of users sort by Top Post, EdgeRank has become a fat of life for most marketers.” Not sure what the problem would be anyway.